This version comes with the first color plate only. The remaining plates are cached throughout the Portland and Mt. Hood area, and it is up to the reader to follow clues to assemble the full collection. The eleven full-color plates are archival inkjet prints. The images are 5.5. x 4.5 inches each and are printed as a signed edition of 200. Price includes first-class shipping within the U.S. The River in the Cellar is a work of short fiction with corresponding illustrations hidden and to be found by each reader. 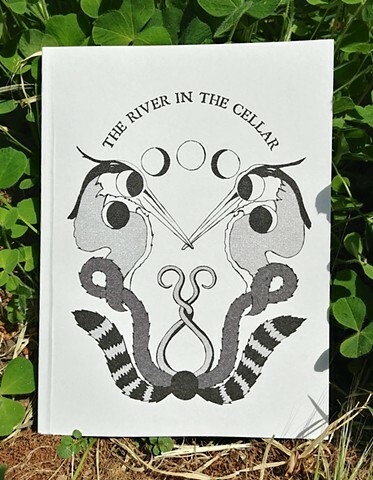 The narrative of The River in the Cellar guides the reader on a scavenger hunt, using clues in the text, locating and assembling the printed color plates that complete the book. Set in the fictional city-state of Multnomah, The River in the Cellar tells a story of a refugee who is seeking a home. The story takes place in the future depicted in Pierce’s paintings. It’s a world responding to catastrophic climate change and the collapse of the nation state. In its place is self-governance, community resilience and a recentering of human society around the health of natural systems. The story leads the reader into a future with questions about the roles of justice, human industry and the place of our species in an altered world.